Beloved readers, I am in Spain right now! I left on Thanksgiving Day to travel across the ocean with my mother on a grand five-ish-day adventure. You may recall that my mom had initially planned to check a bag for this less-than-a-week vacation (we’ll be back on Wednesday), to my extreme befuddlement. I am pleased to announce that I rose to the challenge of traveling with only a carry-on, and since I like to write about what people pack, I decided to show you all what went in my suitcase. Er, backpack. All my stuff that’s going to Spain! 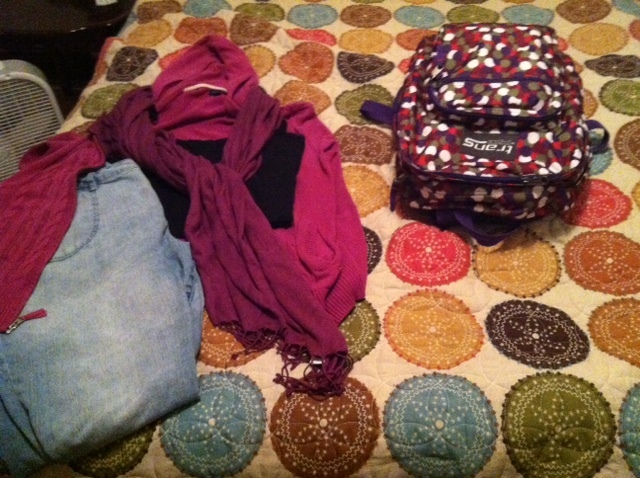 To wear on the plane: Jeans, black tank, purple sweater, purple scarf. You know you’re living simply when that list looks like too much. However, I would use all that stuff if I was staying at home for five days, so I really shouldn’t worry too much. Though I don’t read on the Kindle often… but that plane is going to get boring. I also plan to pack some snacks. You may have noticed that I did not pack toothpaste or shampoo. I plan on buying a box of baking soda when I arrive in Spain, problem solved on both counts. If I had experience using it as deodorant I’d do that too but I don’t want to try that out without backup deodorant. I also didn’t pack a hair brush, because I am planning on borrowing a comb from my mom for the trip, which will be less cumbersome than my bulky hairbrush. All in the bag, with room to spare. Posted in: What's In Your Suitcase? Cool! Maybe you could write a post about eating vegan in Spain. I hear there are limited options, but hopefully you’ll get to try some tapas! HAVE FUN! I have eaten a ton of vegetable paella, which may or may not have had chicken broth in it, but I’m sort of feigning ignorance. I’m not fluent enough to ask all the sorts of nitpicky questions I needed to ask to eat totally vegan (though I did, yesterday, find a flyer for a vegan/vegetarian restaurant, shame we missed it). I found some sorbet at the ice cream places without issue, which was great. Have a great time, I returned from a short trip over Thanksgiving, for my baking soda (for toothpaste) I pack a small pill bottle (washed out of course) that easily stores all the baking soda I would need for more than a week. 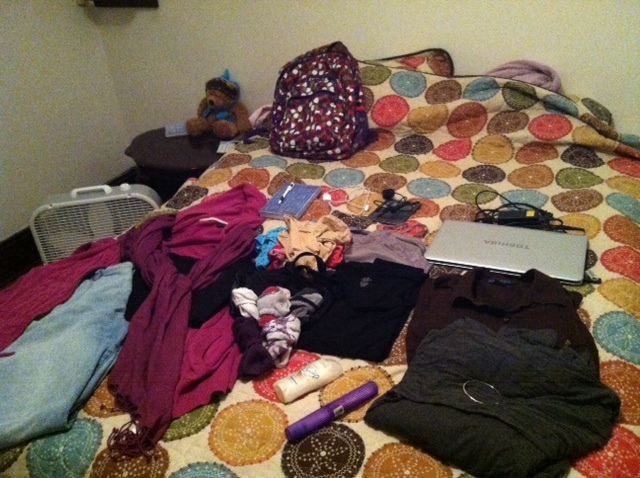 I love packing light! Definitely makes traveling easier. Have a great trip!